Post 1 card on your bulletin board and let those who wish to participate, create new words on the board. Store the cards in an index box or hole punch one side and use a binder clip/string to keep the cards together. Word Building helps to strengthen and maintain skills for speaking, listening, reminiscing, critical thinking, communication, storytelling, and imagination. Each card contains large print so that the words are easy to read. Just print on card stock, laminate, and cut to start the fun. Hole punch one corner and bind the cards together with a binder ring or ribbon. You may use a tablet or computer, if printing is not an option. Each card allows the participant to express their thoughts and opinions when reminiscing or engaging in meaningful conversations. To play: Choose one card and write the word on a whiteboard or blank sheet of paper. Count how many different words you can make using the letters from the word on the card. You can also use the words to play hangman. 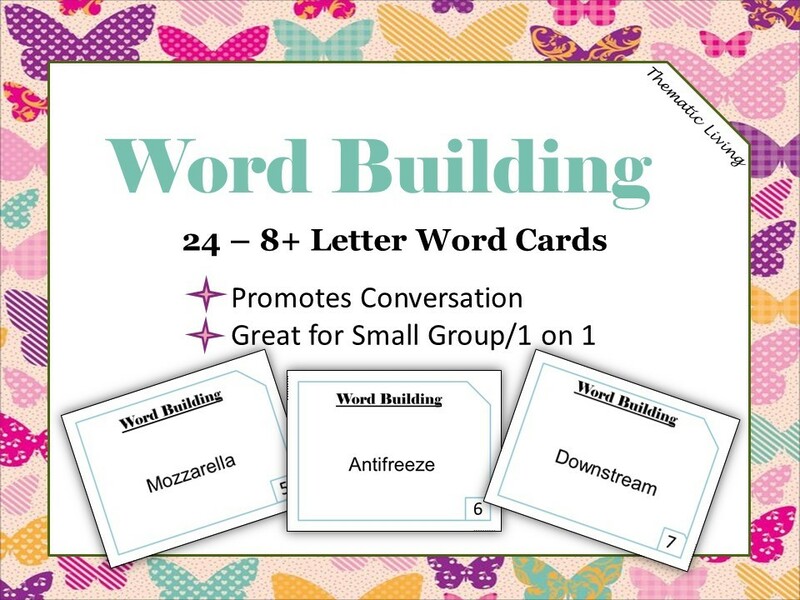 Extend this activity by asking what comes to mind when they hear the word on the card. For example, Mozzarella – I remember making fresh mozzarella to use on homemade pizzas.